Kettlebells are a great item to have at home for working out. The best kettlebells to buy will depend on many things – the space you have, your budget, and how many different weights you’ll want. I’ve chosen some of the best selling kettle bells available at the moment which will suit many different situations. Kettlebells, sometimes known as Russian Kettlebells, are weights that have a handle on the top of them. They are used for many different kinds of weight training exercises including lifts and swings. They provide a very different kind of workout to regular weights and are a great addition to a home gym. There are many things to consider when looking to buy a set of kettlebells for home. First of all is your budget. Vinyl bells are often cheaper than cast iron sets, but can come in a more reduced amount of weight variation. You’ll also want to think about what weights you’re likely to want to use and the best way your budget will be able to get those. A whole set can become quite expensive especially as you get in to heavier weights. If you want to train with heavy duty and large size kettle bells I recommend going for the cast iron weights as they go much higher without compromising too much on size. Also think about where you’re planning to train – are you going to be worrying about breaking something, or perhaps about kids picking them up? Being able to store them easily might be something to consider. 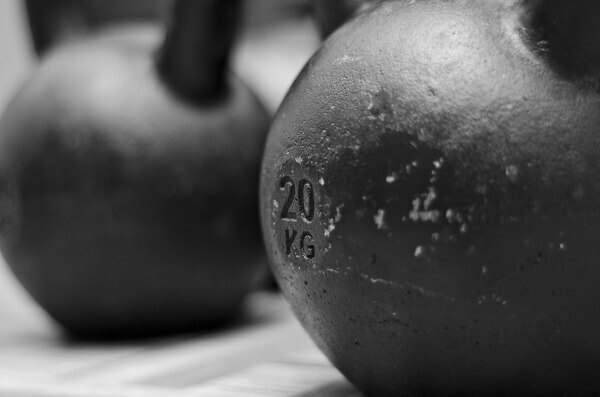 Kettlebells come in various sizes from the smallest at about 4kg all the way up to competitive sizes such as 40kg. The heaviest I’ve seen is 50kg like this one. Bear in mind that you’ll be doing different kinds of exercised with a kettle bell than normal weights so don’t rush in to getting the highest size. A good size for men to start with would be around 10kg or 12kg which allows you to get used to the exercises and keep good form before moving up. Women might want to start a little lower, depending on their strength when starting – 6 or 8kg might be good for them. Cast iron kettlebells are the most popular kind and my preferred version. 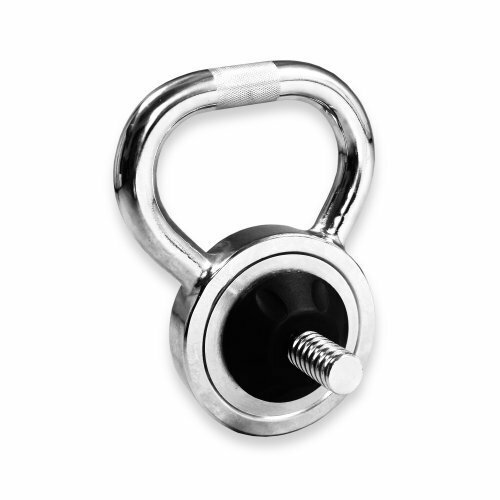 If you can, get them with either an enamel or a neoprene coating like these bestselling kettle bells from JLL as that can prevent any kind of marking on the floor as well as being slightly more comfortable to use. To see more about this set, including the price for each size, click here. 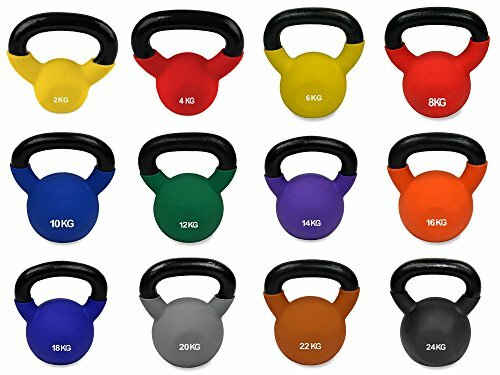 If you’re looking to get started with some cheap kettlebells and want an inexpensive set to begin with, these vinyl kettlebells from York Fitness are a really great buy. They come individually in all sorts of weights from 2kg to 20kg. This can also be bought as a set here which is a little bit of a more economical way to purchase if you need the lighter set. 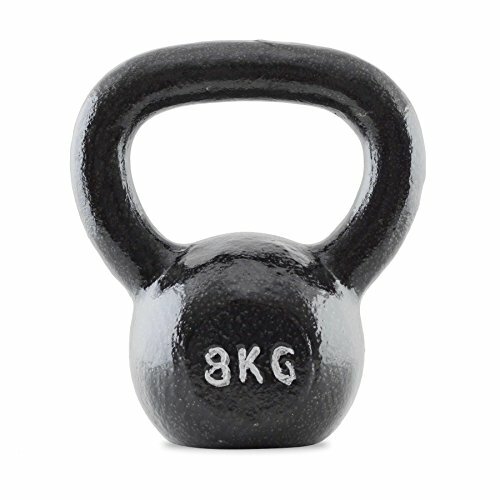 One downside to vinyl kettle bells is that they are much larger in comparison to their weight and so take up more space, which might be something to consider if your home gym space is compact although the fact they are much more affordable might outweigh this. To find out more about these and the latest price click here. 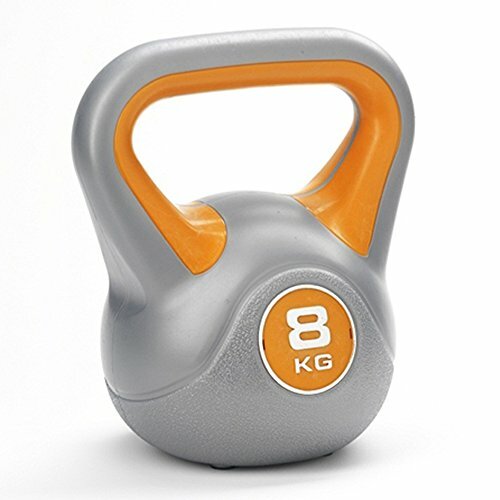 This one from Bodymax is a solid and well balanced kettlebell. If space is an issue then getting some cast iron kettle bells is a good idea as they are much smaller than their vinyl counterparts. These kettlebell weights are comfortable to hold, come in a classic black look which will look good anywhere and will keep looking good even after a lot of use. They also come in a variety of sizes – starting at the lowest which is 4kg all the way up to 40kg. These are really serious sizes and for anyone who is looking to really up their game with their workouts! If you’re really short on space and want to have a compact kettlebell that will work for you then looking at an adjustable kettlebell is probably a good idea! Basically you have a basic kettlebell and can adjust the weight by adding weight plates to it. It would be especially good if you already have these at home as part of your dumbbell set. If you’re looking for a budget option for some heavier kettle bells this could work out well. 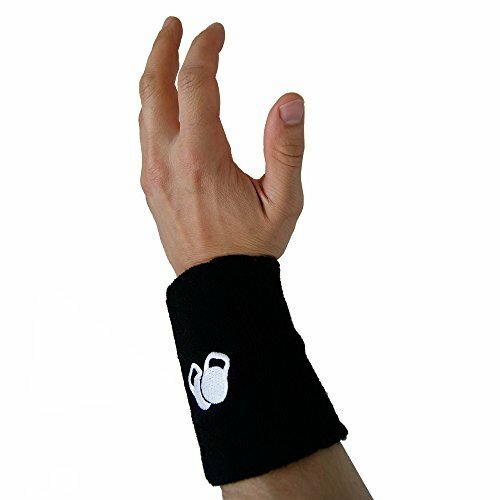 If you’re going to do any sort of kettlebell training on a regular basis then a wrist guard is a really good idea. This one has plastic inserts to provide more support and the material means they can double as a sweat band. They don’t interfere and cause you to have bad technique either. To find out more, including reviews of this product click here. If you’re looking for kettlebell exercises to try or a kettlebell training routine take a look at my post here.